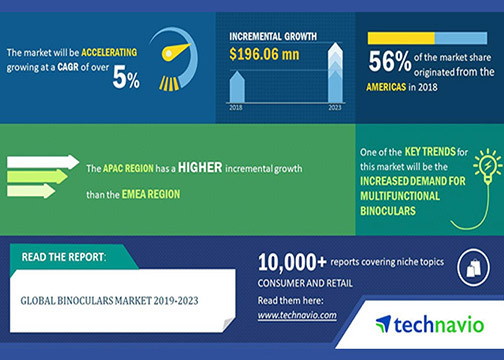 Las Vegas, NV—Driven by multifunctional binoculars, the global binoculars market is expected to post a CAGR of more than 5% during the period 2019–2023, according to the latest market research report by Technavio. The findings are based on Technavio’s Global Binoculars Market 2019–2023 study. A key factor driving the growth of the binocular market is the increased popularity of outdoor recreational activities. Technavio believes that hectic lifestyles raise stress, which leads to increased participation in outdoor recreational activities. “The growing need to de-stress is leading to increased engagement in leisure and outdoor activities. Globally, the growth of adventure tourism is due to factors such as urbanization, hectic lifestyles and growing health consciousness, which is contributing to an increase in the demand for binoculars,” the research firm asserts. Moreover, vendors are focused on providing consumers with multifunctional binoculars for different outdoor activities, such as hunting binoculars. For example, Diamondback binoculars by Vortex Optics come with reliable high-performance hunting optics. In addition, the phase-corrected prism, waterproof and fogproof build as well as rugged rubber armor make them durable for outdoor activities like hunting, camping and wildlife safari. Technavio also highlights the increased demand for multifunctional binoculars as one of the emerging trends in the global binoculars market. Vendors are zooming in on innovating technologies to gain the attention of an increased number of customers. They also seek to raise the customer base and demand for their products. 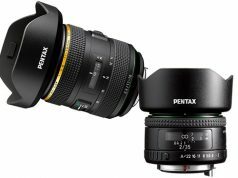 During the past five years, several vendors introduced ergonomic designs. These designs contribute to aesthetic factors as well as reliable performance. “The market for binoculars is gradually synchronizing with the dynamic needs of customers. This encourages vendors to consistently innovate their products,” the report states. 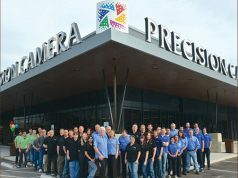 The use of upgraded technologies to manufacture and design binocular also is helping vendors introduce new concepts that focus on functionality, convenience and quality. Therefore, Technavio projects that the demand for multifunctional products will rise among customers as the products provide increased convenience and enhanced results. “The emerging e-commerce industry, especially in developing countries such as Brazil, China and India, will help the global binoculars market to grow at a significant rate during the forecast period. Revenue generated by the global online binoculars market is growing gradually. Online sales of binoculars are expected to grow significantly. They will have a positive impact on the global binoculars market by the end of the forecast period,” said a senior analyst at Technavio. In addition, Technavio’s market research report segments the global binoculars market by application—military, wildlife observation and hunting, astronomy, others. It also segments it by geographical regions (APAC, EMEA, and the Americas). The Americas led the market in 2018 with a market share of close to 56%. APAC and EMEA, respectively, follow. However, during the forecast period, the APAC region will register the highest incremental growth, followed by the EMEA region.